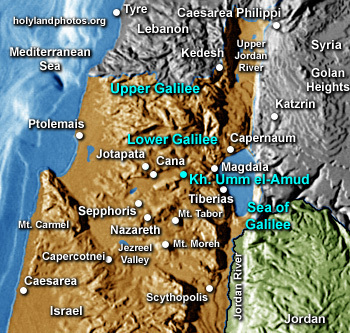 This image illustrates well this road as it comes—from west to east (left to right) from the Bet Netofa Valley, over the ridge by the olive grove, and begins its descent (east) through the brown fields and green groves to the Sea of Galilee. It may have been here, in the vicinity of Kh. Umm el–Amud—along this road—that the “royal official”—who was traveling from Cana to Capernaum—received word that his son had been healed (John 4:46–54). For more information on this route and Kh. Umm el-Amud—including the synagogue and lion relief—Click Here. This entry was posted in New Testament, Places in Israel and tagged Khirbet Umm el–Amud, Panorama, Road, Route, Track. Bookmark the permalink.